Extensions for X-POLE Sets using X-JOINT's. Please be careful to choose the correct metal & joint type. A 125mm and 250mm extension are included in the set. Optional extensions are available in 100, 125, 150, 175, 200, 250, 300, 500, 750, 1000 and 1500mm sizes. PLEASE NOTE: if ordering an extension that will be ADDED to the existsing extensions in your set, you may need to purchase an extra X-JOINT as well to connect the poles together. Please contact our sales office on 02 9589 2645 or at sales@x-pole.com.au if you need clarification on this. IF YOU'RE USING ALL YOUR EXTS & YOU'RE ONLY 50-200mm SHORT - please note the 125mm ext in your kit will not work with any additional extension 200mm and under, as these only have one hole for the X-Joint. You would need to replace the 125mm with an extension that incorporates both lengths (the 125mm & the required length). Call us if this is confusing before you order, as we can't refund shipping costs for items that are incorrectly chosen. Using the full allowed length of the bottom adjuster and both of the extensions included in the X-PERT set, your pole will fit ceilings from 2235mm to 2735mm. Any further increase in height will require additional extensions. 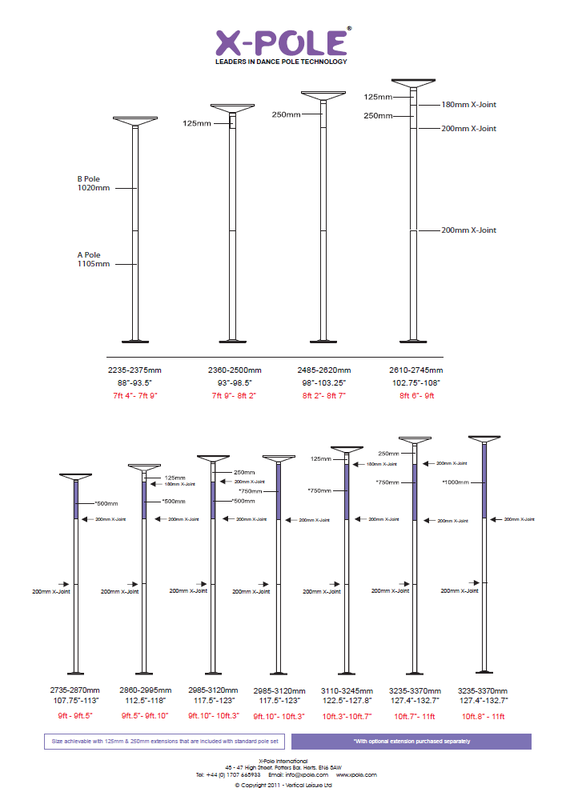 Use the height chart below to work out what length of extension you need - the less joints the better, always choose an extension that will mean your pole will have as few joints as possible. The quality easily met expectations (we all know xpole has the best!) but it was the customer service team that truly went above and beyond! I had been waiting for months for the part I needed to come in stock but once I emailed the team they had a list of alternatives. I paid for my extension (the last one in stock) but it got lost in the mail - so they UPGRADED my part to the newer version and sent me the joint converter for FREE with express shipping. Couldn’t be more pleased or impressed. Thank you!! I needed an extension for my pole but was very confused as to which part to order. X-pole staff were so patient with my many phone calls and service was amazing and so helpful! I changed rooms and needed an extension piece to add to my pole. It was easy to figure out what height I had and what additional piece to order. It arrived easy and not overly long and was easily added on and put up. Feels sturdy with my xpert. Would recommend and would buy again. I ordered an extension piece and was very pleasantly surprised how quickly it reached me here in Perth. I was also provided with helpful advice on the phone before my purchase. Piece fits easily and pole is up and running again! Thanks. Product was delivered on time, to spec, and came out of the package in pristine condition. The X-stage now fits in MANY more rooms with the 1m top tube - every X-stage should come with one!! I ordered the wrong extension & realised when I went to pick up from factory that I needed the "screw in" type. I phoned head office & they organised someone in the factory to get me the right one there & then, very happy with both customer service & product. I relied solely on the height chart when I ordered the extension. When I was about to install it, the extension was way too long. Worse, the product was not polished which ruins the aesthetics of the entire Xpole set. It is better to talk to Xpole specialists when purchasing your extension. Best pole, but slippery when you first use it but its all good after a few weeks! I couldn't have asked for better service. I placed my order which was promptly received, unfortunately damaged in transit. After notifying Dance For Me of the damage, a replacement extension was quickly dispatched. It matched X-poles superior quality. My ceiling in the room that I wanted the pole in has a height of 3000mm, so according to the fitting guide i bought the 750mm extension. It arrived a week later in perfect condition. Excited I went to put it up and the pole didn't fit! Luckily I have another room with a slightly higher ceiling so I've put it up in there. No drama but My advice is to be very accurate when measuring and if you are just on the smaller side of an extension fit, then go the next extension down if possible/safe.